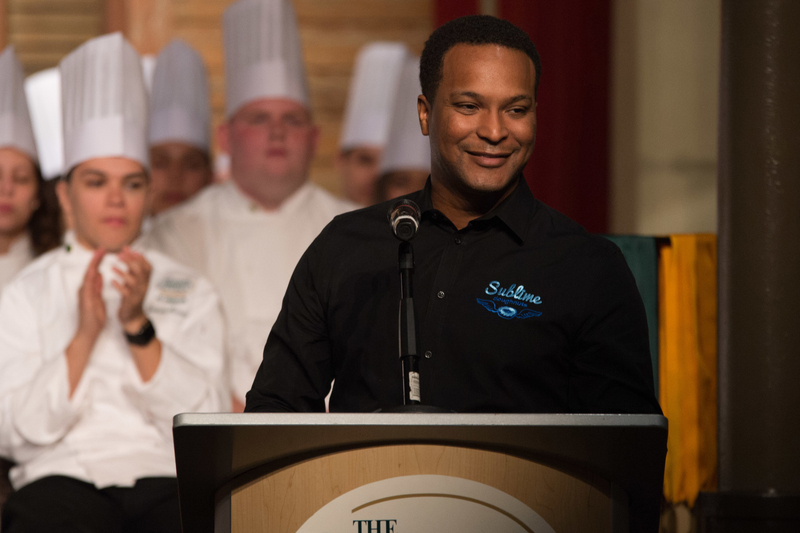 San Antonio, TX – Kamal Grant, a 2004 graduate of The Culinary Institute of America’s New York campus and a U.S. Navy veteran, delivered the commencement address at the San Antonio campus of his alma mater on April 13. Grant is the founder and creative director of Sublime Brands. What began as a small doughnut shop near Georgia Tech in Atlanta in 2008 now includes two additional locations in the Atlanta area—including one certified kosher—with two more on the way at Mercedes-Benz Stadium. Chef Grant also opened a Sublime Doughnuts in Bangkok, Thailand. He is known for his artistic presentations and creative flavor combinations such as Fresh Strawberry N Cream, Salted Caramel & Reduced Balsamic Vinegar, and Chocolate Wild Berry Fritter. Grant’s creations earned Best Doughnuts in America honors from both US News & World Report (2013) and Food & Wine (2012). Bake magazine named Sublime Doughnuts America’s Best Bakery in 2012. Grant served in the U.S. Navy from 1998 to 2002, using his GI Bill and Navy College Fund benefits to attend the CIA. It was as a Navy baker that he realized how much his shipmates loved doughnuts. Traveling the world while in the service also exposed him to diverse ingredients and flavor and texture combinations that he has incorporated into his products. The CIA San Antonio offers associate degrees in both Culinary Arts and Baking & Pastry Arts. Graduates can then transfer to the college’s New York campus to complete bachelor’s degrees in Food Business Management, Culinary Science, or Applied Food Studies.